Common Injuries From Slip and Fall Accidents | Hupy and Abraham, S.C. The injury that you suffer in a slip and fall accident can only be diagnosed by a doctor. In order to protect your physical—and your legal—recovery, it is important to see a physician as soon as possible after you fall and to tell your doctor about all of your symptoms. Your doctor can then create a treatment plan to help you recover from your injuries and a medical record that will help you prove those injuries during settlement negotiations or in court. Brain or head injuries. Traumatic brain injuries and skull fractures can be life-changing. They require immediate medical attention to prevent the injury from worsening. Headaches, loss of consciousness, changes in vision, changes in behavior, or changes in cognitive skills may be signs of a traumatic brain injury or head injury. Spinal cord injuries. A spinal cord injury may be partial or complete. Every spinal cord injury is medically significant and requires immediate care. Complete spinal cord injuries result in permanent paralysis below the point on the spinal cord that was hurt. If you have any numbness, paralysis, pain, tingling or other potential symptoms of a spinal cord or back injury, then it is important to get prompt medical attention. Broken bones. Any broken bone can be a serious injury that limits your mobility, interferes with your work, and impacts your everyday activities. While any bone in the body may be broken in a fall, common broken bones include hip bones, tailbones, arms and wrists, and legs and ankles. Any pain, limitation in mobility, or disfigurement should be immediately reported to a doctor. Dislocated shoulder. Dislocated shoulders can be painful and without medical treatment they can result in permanent problems. If you experience swelling, numbness, weakness, bruising, or difficulty moving your shoulder, then you should see a doctor as soon as possible. Eye injuries. Falls are the most common cause of accidental eye injuries. 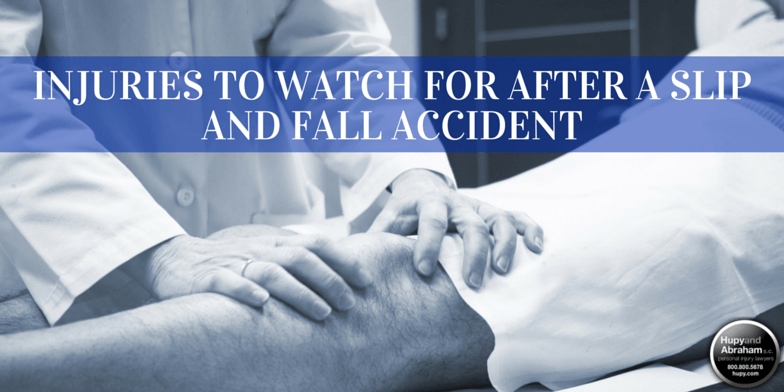 After a fall you should watch for any pain, changes in vision, or bruising and see an ophthalmologist as soon as possible if you exhibit any of these symptoms. An eye doctor may be able to prevent the injury from worsening and in some cases help you heal. Additionally, a fall injury can be deadly. The elderly are at a higher risk of dying from a fall injury. However, anyone who falls may be at risk particularly if they suffer a brain, head, spinal cord injury, or other serious injury in a fall. If you have lost a loved one, or if you have suffered any of the injuries described above, then you deserve to know more about your rights. You need to find out whether the property owner was responsible for your fall. If the property owner knew or should have known about the condition that led to your fall and if the property owner failed to fix that condition or warn you about it, then the property owner may be legally responsible for paying for your injuries. However, a financial recovery will not be automatic. Instead, you will have to fight for your fair and just recovery. An experienced Illinois slip and fall lawyer can help you do that by investigating the cause of your accident and fighting for your fair and just recovery. To learn more about your case, your rights, and your recovery please contact us via this website or by calling 1-800-800-5678 to schedule a free, confidential consultation.